In your booklet “Discover Together the Embers under the Ashes,” you write that the state of the church is dramatic. How so? There are entire generations that hardly notice the Church any more, or else perceive the Church as something where everything just stays the old way. This is dramatic and the opposite of what the Church most deeply is. Does the Catholic Church need another Reformation? There is always need for a reform. There is the saying in theology, “The Church must ever be reformed.” Those who close themselves to this are putting the mission of the Church at risk. … Among other things, you write that it should be possible also for married priests, that they be admitted to ordination. … who are in full unity with the Roman Catholic Church. Pope Benedict is their Pope. I point out that many things that people experience in the Church as rigid ossification are not essential to our faith, but rather a regulation that could also be handled differently. You support ideas that sound revolutionary: for example, that the people should have a vote in the selection of bishops. That isn’t revolutionary. I belong to a Church that cultivated this tradition from the beginning. Great bishop figures whom we honor as saints were chosen by the people. Martin of Tours didn’t want to become bishop and, according to tradition, hid himself in a stall. The geese in the stall honked and so they found him. How could such an election of bishops function concretely? There are different ways. In Switzerland we have the example of the Diocese of Basel, where all the baptized are invited to speak out about the description of the future bishop and possible candidates. A sense of responsibility is thus awakened in all the baptized. You also hold that ordinary people should advise the Pope. When I myself stand before challenges, I generally speak with people from other contexts and with other experiential backgrounds. These people don’t simply say what pleases me and what I want to hear. Such an external advisement would also be important for the Pope. Does this mean that people who have no idea about real life are advising the Pope? Not that, but those on the outside bring aspects into a discussion which can’t be brought in by someone who is part of the system. Precisely when one bears responsibility and carries out a leadership role, one needs advice. Saint Benedict taught us that the Lord often reveals to the abbot and community through the youngest something which is better. Through one from whom you don’t expect anything. At Thursday prayers in the monastery church you said that, thanks be to God, it is Jesus and not the Pope who has the say in the Church. That sure sounds like criticism of the Pope. Not at all. The Pope surely wouldn’t have trouble with this. Whoever has responsibility in the Church must above all be one who hears and obeys. The Pope is not the Lord of the Church. Is he not God’s representative on earth? For many Catholics, what the Pope says has the character of law. That is not the intention of the Pope. It is problematic when it is understood thus. You also hold that one could eliminate cardinals. There is not one word about cardinals in the Gospels, nor in the Catechism. To eliminate them would be no problem for the faith, but merely a question of organization. In any case, the college of cardinals is hardly used as an advisory council. But to eliminate something, there first needs to be a better alternative. You write that polarization between progressives and conservatives in the Church is enormous. Don’t your progressive positions just contribute to this? These are hardly progressive positions. In my booklet I base everything on the tradition of the Church. A journalist rightly wrote that my statements are nothing new. But because I go public in an understandable language, it is perceived otherwise. Your positions may belong to tradition, but they aren’t the reality in your Church. Oh yes. The examples I give in my booklet are most certainly examples from the reality of the Church. A small part of the reality! But it exists. And it can be extended further. I strive to show that there are possible paths for many pressing problems in the Church that do not lead to a dead end. I don’t focus the problem on the question of female priests, but rather take up a theme that was treated in a document of 1994 from John Paul II. He said that the ordination of women is excluded. Many say that with this the case is closed. I state that a question remains: is the gender of a person ever a question of faith? So: is this a question of faith or not? Of course the answer is No. With this question it becomes possible to speak again about the topic. A Church official writes: “Abbot Werlen divides the Catholic Church with his controversial ideas.” Are you a divider? Not, not at all, because I always argue from the tradition of the Church. Furthermore, negative reactions come exclusively from people who have not read the booklet, but only newspaper articles about it. If possible, I write to these critics and include a copy of the booklet. Do you hope that Rome reacts to your booklet? The future of the Church must concern all of us, not just Rome. If I were to expect from the Pope that he flip a switch and everything changes, we would more or less be in the same place as before. In the Church as a whole, a new culture of being with one another must come about. My booklet is a modest contribution to this. There have already been reactions from Rome. 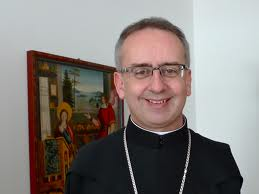 For example an interview with Cardinal Kurt Koch in the Tages-Anzieger. And what did Koch say about you in the interview that appeared about five weeks ago? The abbot of Einsiedeln is someone who is not lacking in fire. He certainly poses justified questions. But his perception as a whole is rather onesided.